REFERENCES. WHAT DO OUR CUSTOMERS THINK? I absolutely enjoyed my 15-day tour in Rajasthan with India Driver Tours. My driver, Sudarshan (“Sud”), was very professional and experienced, spoke very good English, and knew these destinations inside and out. He gave me great tips and advice on the sights, and recommended good and reliable restaurants. He never pressured me to visit any shops, but when I expressed my interest in buying gifts, he recommended great shops that sold authentic souvenirs. For a solo traveler like me who had never been to the country before, India can be difficult to navigate on one’s own. Thanks to India Driver Tours, my trip was very smooth, stress-free and comfortable. I recommend this company to anyone interested in visiting the country. Thank you for organizing the wonderful trip, and give my thanks to Sud too! Prior to visiting India with my husband, son and daughter in – law in December of 2015, I researched this company on their website, emailed them and within the same day received response from Amit. He was agreeable to all our requests and tailored an itinerary for the Golden triangle trip that suited us. No change or request was an issue for him. I think I bombarded him with emails and he responded to all of them. Amit’s knowledge and suggestions of places we visited, recommendation of the restaurants and the professionalism with which he conducted himself was faultless. His command of English is excellent so communication was no problem. We felt safe at all times and he made us feel so comfortable that at no time did we feel that we had only just met him. I have already recommended Amit’s company to a number of my friends and relatives both in Australia and New Zealand. Certainly recommend his company to anyone out there who is planning a trip to India, if you want an excellent service, clean, safe-car, and a hassle-free trip, then contact Amit. “It was our first time in India and we considered the different options for touring around including package tours, small groups and independent travel using public transport. In the end we decided on a package with Indian Driver Tours which comprised a Car + Driver + mid-range hotel option. I am pleased to say that everything worked out as planned, as described on the website. The main advantages to us was the flexibility of selecting our destinations and the number of nights at each stop. We also found that we could vary our plans at short notice when we wanted to rest and relax. Our driver, Anil, was very experienced and was very capable of handing all the different journeys. We just sat back and enjoyed the ride. The hotels were clean and comfortable and the heritage ones added some character and colour to our Indian experience. We would have no hesitation in recommending this option, particularly if you prefer independent travel. Thank you once again for arranging our driver Naresh for our 3 week trip around Rajasthan. Naresh made our visit to India a pleasure. He was always on time (early), his Innova was spotlessly clean inside and out and he was a great driver in the chaos of India’s roads. He gave us information about Indian culture and helped with arranging guides for us at some of the sights on our journey. We felt that nothing was too much trouble for Naresh and would highly recommend him. Everything with India Driver Tours was seamless and easy from start to finish. Prior to our arrival I communicated with Amit via email; he was informative and quick to respond to all of my queries. He helped design an itinerary for the Golden Triangle that suited the limited time we had, but still fit in everything we wanted. He also suggested some great hotels and took on board our preferences when booking (all of our accommodation was great). Our driver, Atma, was also fantastic. He was very friendly and professional and happy to share his local knowledge; he recommended some great restaurants and organised an excellent guide for us in Agra. Atma was always easy to find, even at the busiest of attractions, and made our whole trip run smoothly. India can be a bit overwhelming at first, but Atma always helped us feel at ease and answered any and all of our questions. If you want a stress-free tour in India then I cannot recommend this company highly enough! Thank you again to Amit and Atma for making our first few days in India so perfect. As two ladies travelling alone, we haven chosen a three day trip with India Driver Tours in April 2016 and didn’t regret it a minute. Our driving tour started punctual in Delhi, took us to Agra, Fatehpur Sikri, Jaipur and back to Delhi. Correspondence upon our indivdual selected itinerary before and during our trip was very professional. Our car, a Toyota Innova, was decent, comfortable and the air condition a release since we had daily temperatures of around 40 degrees celsius. Our driver, Atma, was experienced, courteous and very pleasant. During our trip he gave us valuable tips and organized a tour guide for us in Agra for the Taj Mahal. We always felt safe driving with him. Our trip with IDT really couldn’t have been better. Thank you Amit, we will definitely recommend your agency in the future to friends and others. Please tell Atma a warm hello from the two German ladies. It was a pleasure driving with him. We wish you a prosperous future with IDT and all the best for you and all your employees. We chose a 10 day package with India Driver Tours in Aug 2015. All of the correspondence before we arrived in India was very efficient and professional and all of our queries were answered promptly. The itinerary we were sent was great and we were able to alter it as we wanted slightly longer in some places. Amit was our driver and our first day was a tour of Delhi. It was fantastic and he showed us all the sights. He was very knowledgable and organised rickshaw rides and took us to a very authentic restaurant for lunch. We then undertook a 9 day tour of Rajastan. The car Amit provided was very clean, comfortable and with good air conditioning which was ideal as my wife was pregnant. We toured Pushkar, Jodhpur, Jaipur, Udaipur and Agra before returning to Delhi. The whole trip was seamless and Amit took all the stress and strain out of it. The hotels were all midrange and very comfortable. Especially the Havelis in Jodhpur , Jaipur and Udaipur. We were dropped at all the main tourist attractions and Amit took care of us brilliantly ensuring we knew where to go advice on what to do. His recommendations for restaurants were always good. Overall we had a great time on our tour of Rajastan and it was all down to Amit. He knew just when to speak and make conversation but also when we just wanted to watch out of the window of the car, read or snooze on the long journeys he did not try to force conversation. He is an extremely polite, courteous and professional man and it was a pleasure to meet him. We would recommend India Driver Tours unreservedly and hope that one day we might return. I was a solo female traveller and very happy with my decision to organise my trip with Amit. I used Amit to do sight seeing in Delhi, Agra and Jaipur and back to New Delhi airport. It was really easy to organise the trip via email (itinerary, hotels and sights). Manu, my driver, was excellent. He spoke good English, had good knowledge of the destinations, gave advice/tips on visiting the sights and always seemed to find me before I even started looking for him once I’d finished visiting a sight. The hotels were really good and Manu gave good recommendations for eating places. A guide was arranged for my visit to the Taj Mahal (Bupi) who was excellent. I also asked not to be taken to any shopping places. For a stress-free and safe trip in India I would definitely recommend India Driver Tours and our driver Manu. I used India Driver Tours’ services at the end of August and I was very satisfied. Amit was easy to communicate with over email and has arranged all the details very fast. Neeraj (Bobby), the driver, had very good English and was super helpful in organizing the itinerary. He knew all the sights, was a great driver, and we had many nice chats over the way – he also knew the local places which was great when wanting to catch a bite of the local food. I would highly recommend the services of this company – reasonably priced, professional, and convenient! We sent Amit a list of the places we would like to visit and he came back quickly with a suggested itinerary in our time frame and even was able to move things around when we decided we wanted to add a stop off in Pushkar and also train journey from Agra-Delhi too. We were given some choices of hotels to pick, and we were happy with all of the hotels, especially the Khandela Haveli in Jaipur which was superb. Our driver Naresh was brilliant â€“ his knowledge of Indiaâ€™s roads made some demanding journeys completely stress-free for us in the back and he was able to add in some interesting stop-offs like Neemrana Fort along the way too. For any activities we were doing outside of the tour he went out of his way to drop us at various markets or restaurants. We also chose to take the larger car which was well worth it for the extra comfort. 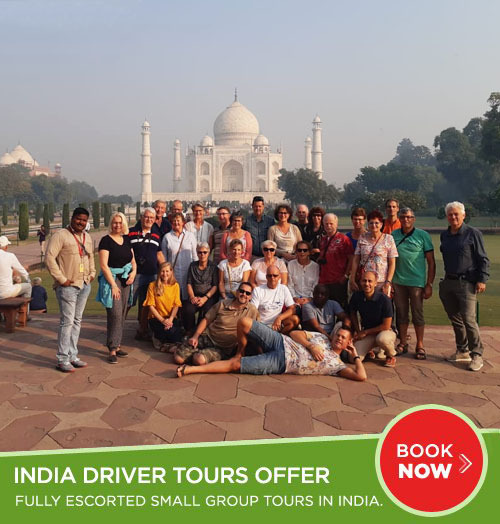 For a completely stress-free trip to India we would recommend India Driver Tours and our driver Naresh to any of our friends who will be visiting the country. Our entire experience – from planning to booking to the trip itself – was a delight. Amit was fantastic at getting back to us via email and we have nothing but great things to say about our driver, Kamal. He drove us Delhi-Jaipur-Ranthambhore-Agra-Delhi which was a great route. We also booked our accommodations and Tiger safaris through Amit, both of which were fantastic. Despite our flight being delayed, Amit met us at the airport with our driver Kamal. Kamal was an excellent and safe driver who spoke great English, he was flexible with what we wanted to see and do and he took us to some amazing local places that he recommended (jalebi in Delhi, Raj Mandir movie theatre in Jaipur, lassi place). We would highly recommend Kamal as a driver to anyone looking for a driver throughout India! Those 19 days in Rajasthan and Varanasi were just fantastic. The hotels you selected were great, always well located and very comfortable. Neeraj (Bobby) is a great driver, not only by his driving skills (driving in India is quite an experience) but also by his knowledge of the different places we visited. He was always available and even in challenging situations he managed to make our trip easy and interesting. He was always available and punctual. When we started to plan our trip, we selected a few companies. By your quick responses and the flexibility you showed in the itineray and the hotel selection, we know we made the best choice. If anybody asks us, we have no hesitation in recommending you for a travel plan in India. I don’t know yet if we will go back in India, but if we do we will contact you for sure and we hope that Bobby will be available. Thank you for everything. We spent 14 fantastic days being escorted around Rajasthan. Our holiday experience was all we could have wished for and more, and this was in no small measure due to the guidance and care of your driver Ramesh. Ramesh started our trip as driver and went way beyond that. Ramesh managed our holiday in many ways making suggestions and giving advice. Our safety and care were always his utmost concern. We have been very happy with your services and will recommend you and Ramesh to any family and friends who may be anticipating a trip to India so they may benefit from the excellent service too. Thank you Amit for making our trip to India so memorable! From the moment we arrived in Delhi and were promptly, warmly greeted by your driver Naresh. He and his immaculate, air conditioned 6 seater was perfect for us and our friends. Naresh gaves us options and helped choose our daily schedule to meet our requests. He gave us great reassurance of being on time and was a very skilled, safe driver throughout our journey. We were able share stories and learn so much about India and all its cultures and religions. It helped so much that we had a driver to speak Hindu when we needed instructions with the locals. Naresh took us to Indian restaurants along our route that provided us with great flavours of India, and at reasonable prices. We were in awe about the many sights of palaces, forts, temples, museums and of course the highlight being the Taj Mahal. Naresh also satisfied everyone’s shopping needs of handmade crafts, clothing and jewelry at smaller shops. We highly recommend Amit’s driving tour and our many thanks to (our driver) Naresh. Namaste! We are two young-at-heart oldies (65 &70) who recently visited India for a 20 day holiday. We used Amit’s travel company on the recommendation of our daughter who travelled with him several years ago. We chose the Rajasthan tour offered on the site but extended it by several days to allow more rest time between travelling days. India is a vast country so some days involved long periods of travel. Any queries were answered promptly and there were also other suggestions for our comfort. For example, they suggested that we hire a larger vehicle for more legroom, which was an excellent idea on our travelling days. We also chose Heritage/Historical style accommodation which was a wonderful idea. Imagine waking up on a film set each morning, with ‘Royal Marigold Hotel’ style havelis and palaces. A great way to experience the India of old. We also chose to visit a desert camp out of Jaisalmer for an overnight stay in a big Swiss tent. That was an amazing experience with traditional Rajasthani food and entertainment, after a sunset camel ride to the dunes.Our driver was Amit, a lovely young man with beautiful manners and a great sense of humour. He took great care of us, ensuring everything went smoothly and was hassle-free. He allowed us to travel and sight-see at our own pace and also arranged local guides where we desired. Amit also suggested various shopping (yes! we had to shop!) options and was very patient and helpful throughout. He also recommended dining options, which we enjoyed, as the food is so delicious everywhere in Rajasthan. This was an amazing experience, one we would recommend for young and not-so-young, like us. The input and organisation from Amit’s company, again hassle-free, certainly contributed to our overall enjoyment, ensuring a fun-filled, informative and unforgettable holiday experience. We were confident that we were being looked after by an experienced, capable and professional team. And yes! it is possible to spend 20 days in India, eating such delicious food, and not suffer and Delhi belly! Hand wipes and gels are the answer. We revisited Rajasthan recently, in addition to our first trip with Amit last year. As a matter of course we booked Amitâ€™s driver service for our individually organized journey from Udaipur to Delhi again. Amit quoted a reasonable fee including the service of the driver, costs of the vehicle, parking and taxes. We were already expected by our driver Sushil after disembarking at Udaipur Airport. He is a bright and very nice person and he conducted us over a period of ten days in a perfect manner. Our Toyota Innova car was comfortable enough for two passengers and it was clean at any time. Needless to say that Sushil is a safe driver and that he is fitted with the necessary calmness for this area. We visited some very interesting places like Jodhpur, Pushkar, Ranthambore, Jaipur etc. while Sushilâ€™s way of driving was competent and solid at any time. Certainly we had scheduled stopovers at several points of interest alongside the route. Sushil was well-informed about history of Rajasthan, he knew a lot on medieval Kings, Mughals and regional monuments. Therefore he provided some excellent sightseeing suggestions and recommendations about licensed restaurants. Notwithstanding our excursions we could easily comply with our time schedule. Finally we arrived in Delhi, slightly tired but glad having chosen Amitâ€™s service again and having spent many exciting days together with our reliable driver Sushil. The journey was extraordinary memorable and we appreciated the services provided by Amit and Sushil. We would highly recommend their services to anyone interested in an affordable and efficient private driver to explore India. First of all, the service made us feel very confortable and safe while it was our first time in India. It’s very convenient and make us save time to do more and enjoy much better our stay without stress and being tired. In a more qualitative point of view, we had fun and a great insight thanks to Avtar. He’s very friendly and profesional, very helpful. He told us about the culture, history, remarkable facts… he recomended the best places to visit, have dinner, shopping. He gave very great advice, both practical and cultural. I can say that he has a good understanding and respect on other cultures as well so we can feel confident. It was a pleasure to travel in such good conditions with your service, I will definitely recommend you. My son and I arranged with Amit a six day Golden Triangle and safari tour together with two days touring old and new Delhi during our two week holiday in India. We cannot fault anything. Amit suggested a selection of mid-range hotels before our holiday and booked our choices which we found to be very comfortable, well placed and good quality with excellent food and service. In Avtar, we had a great driver who was happy to go along with our suggestions and timings or suggest other places to visit. On visiting the various monuments, we were not restricted to a set time and always found Avtar promptly at the car on our return. He was a safe driver, always punctual in the morning, cleaned the car every day and had extensive knowledge old Delhi and our route. Regarding the car, we would always recommend hiring a Toyota Innova or similar. As there were just the two of us, we originally opted for a smaller car but were pleased when Amit arranged Avtarâ€™s Innova at no extra cost. The extra space, comfort and seat height in the Innova is worth any extra cost on booking. Should we have needed to contact Amit, he left us contact numbers and during our journey, phoned us to make sure all was well. Before we booked, we consulted Tripadvisor and had a shortlist of three drivers/companies. Prices were similar but we chose India Driver Tours from the quick and full responses, the tour suggestions aligning with our initial thoughts and the recommendations on his web site. I think we were lucky in choosing Amit and would not hesitate in recommending him to anyone and in booking him on any future trip to this part of India by us. Many thanks to Amit and Avtar. As our daughter stayed for an International volunteering in India, my wife and I decided to organize a Rajasthan tour with her during our three week Easter holidays. We decided to go with Amit’s company and arranged with him a tour including nearly all recommended places a family like us is curious to see in Rajasthan. Amit’s driver Avtar has been doing this route over 17 years and accompanied us from Delhi until Udaipur, were we took a plane to Mumbai. Avtar is an excellent driver, reliable and always on time. He speaks perfect English, was always friendly and patient trying to fulfill all our individual wishes. His service was by all means professional, so our trip went at least far beyond our experience. All the best to Avtar and Amit. We recommend www.indiadrivertours.com to all our friends who want to see North-India.